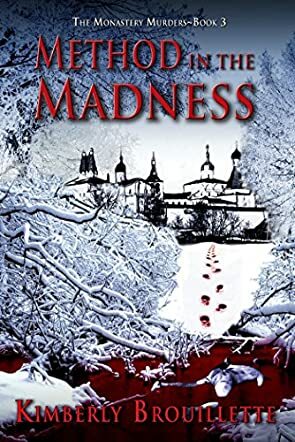 Old sins cast long shadows and the past just won’t stay in the past, unfortunately, in Method in the Madness, the third book in The Monastery Murders series, a psychological thriller and murder mystery by Kimberly Brouillette. A sexual assault on a young girl in 1986 has dire consequences years later and involves innocent people in a trail of chaos and carnage perpetrated by an unhinged killer. When Katy Warsaw notices her fiancé John’s behavior seems out of kilter, little does she know the truth. When John’s adoptive mother disappears, and Katy has a terrible vivid vision about it, she can’t sit by without doing something. When Lt Christopher Williams receives a frantic call from Katy, the police get involved in a missing person investigation. As more questions about the past arise, the most important one is who is John Smith? Can Williams catch the madman before he takes the lives of more innocent people? Clues given by the spirit world add to the intrigue of this mystery murder. Method in the Madness has both a psychological thriller angle as well as a paranormal touch with spirits offering their help and various characters experiencing vivid waking dreams and visions which lead the reader along in the train of events. Although the events start in 1986 and jump back and forth thirty years, the author has clearly denoted this in the chapter headings so there is no room for confusion. I found this knitted the past and the present together very well and although it takes time for the full significance to unfold, the author slowly unravels the mystery. The scenes are chilling and well described, especially the paranormal events, and draw the reader into the action of this complex plot. There is a large cast of characters, but the author handles this deftly. I liked the paranormal angle very much and how the author wove this into the events. Although this story can be read as a standalone, there is mention of previous events so possibly readers should start with book 1. An intriguing read for fans of murder mysteries with a touch of the paranormal.